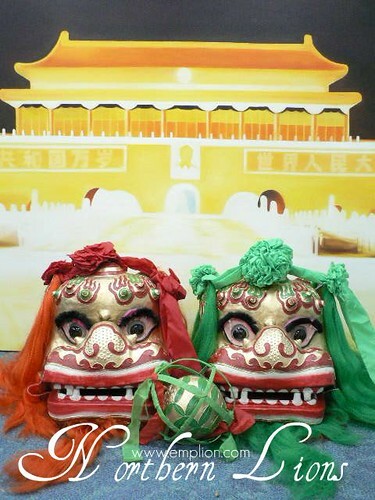 Jet Li's Wong Fei Hong Movie III is an inspiring and exciting lion dance movie! 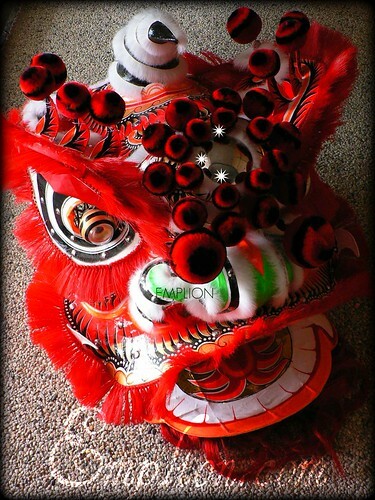 Lion dance has an ancient history which dates back to the Imperial Palace. 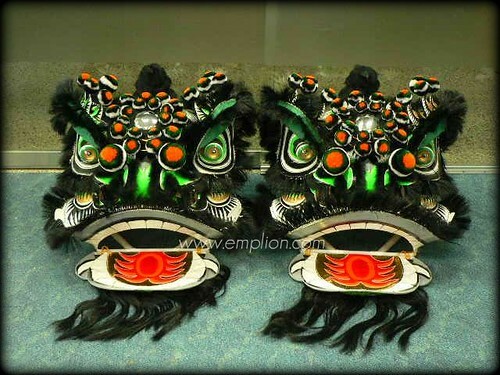 Lion heads were painted and named after famous Liu Bei (Rainbow) Guan Yu (Red) Zhang Fei (Black) Zhao Zhi Long (Green) Ma Chao (White) and Huang Zhong (Yellow). Emplion has worked hard to build a collection of these futsans. 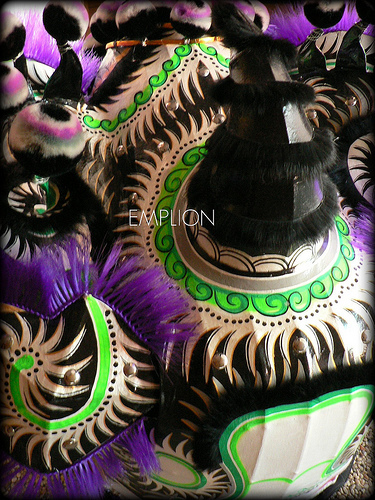 Quality is improved yearly. 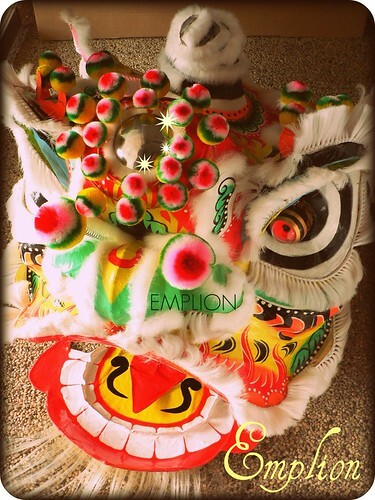 We hope you will find a lion you like and add it to your collection! 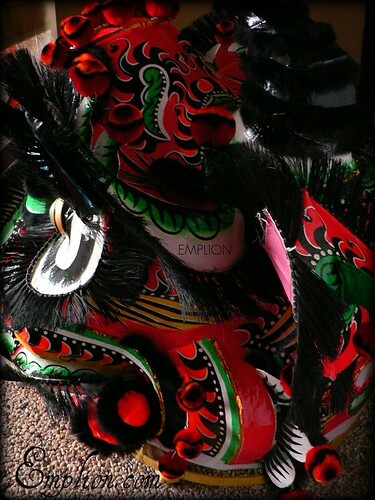 Nice Lion Shape. 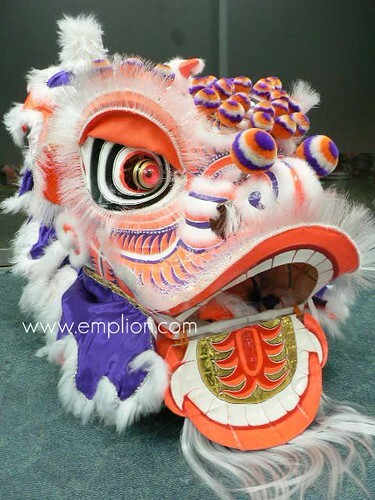 Comes with 2 Pants, 2 Shirt, 4 Lion Claws for each Lion Set. 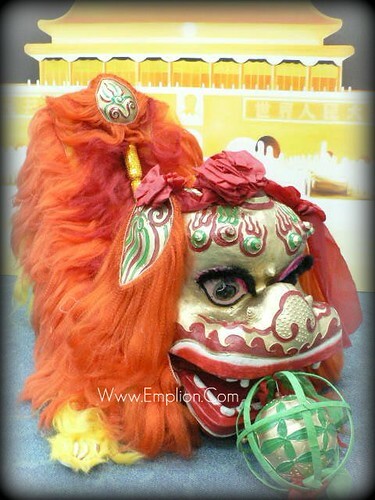 Free 1 Pekin Lion Golden Ball for ordering 2 Northern Lions. 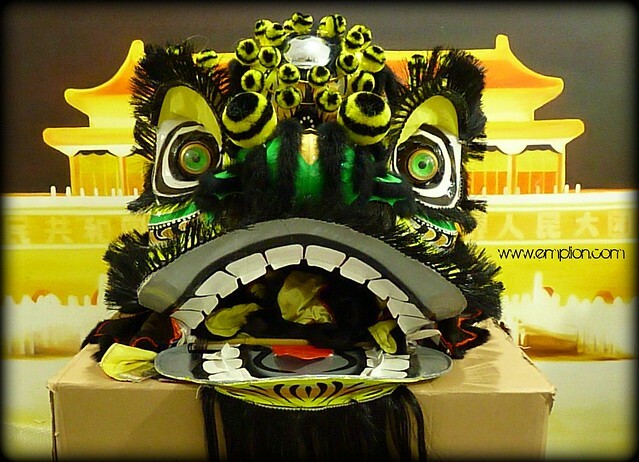 Gold Northern Lions, Black Northern Lions and White Northern Lions are available. Free Home Delivery. 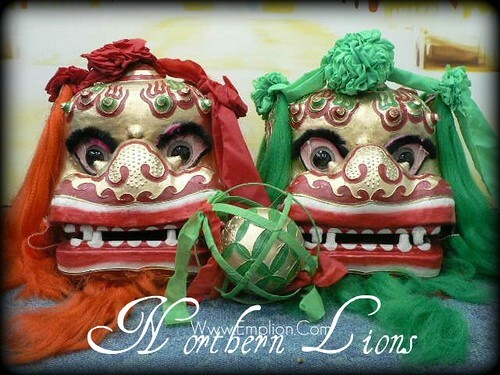 If Northern Lions are not in stock, you may custom order. 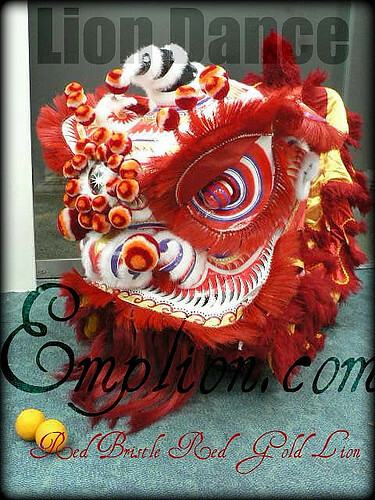 Simply Paypal Emplion a custom deposit of $250 per lion, balance payment of $600 upon custom completion. 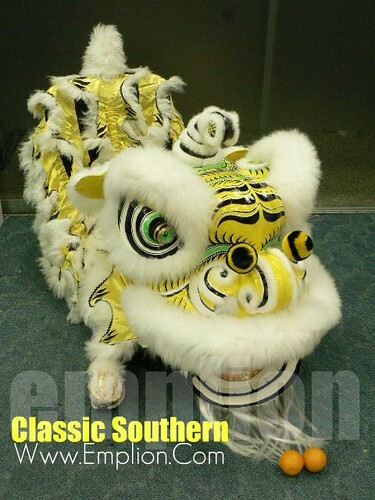 Your custom $850 each Northerm Lion will be ready within 2 to 3 months time. 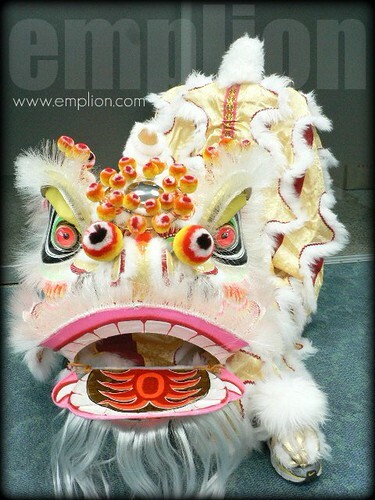 We will send you an email with pictures of the custom lion and deliver the lion to your home.﻿ Free Express Shipping. Door to Door Delivery. Here is a list of lions. 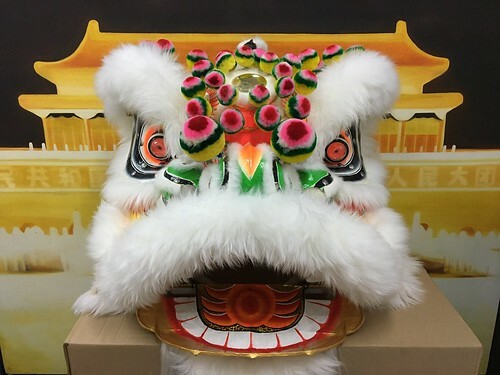 You can use it as a reference for your next custom lion. Baby Size 4, 48 inches rim. 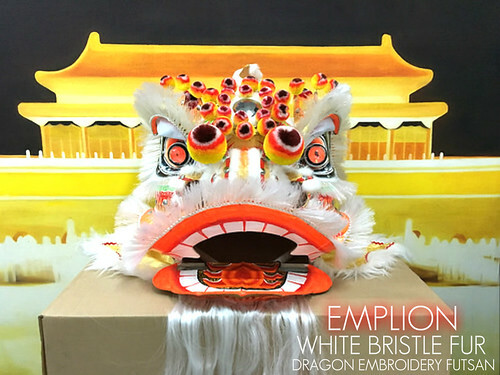 White Bristle Nylon Fur Gold Lion. 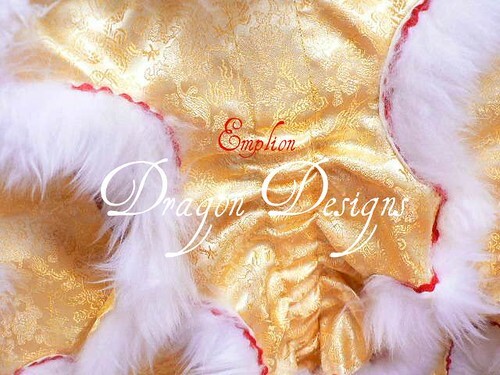 Baby sheep's fur exclusive gold dragon embroidery ﻿body, wagging pony tail, belt straps, shoulder straps and 2 lion pants. For kids age 8 to 12 years old. Adult Size 2, 56 inches rim. 28X28x28 inches Head. 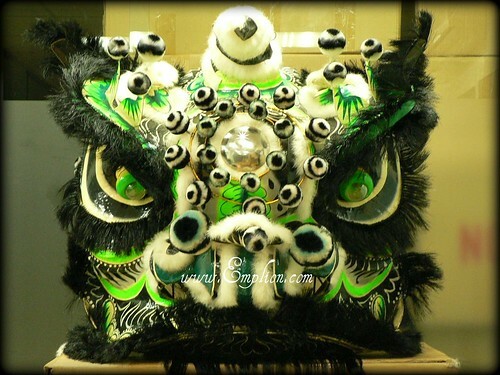 White Fur Special Custom Silver Green Futsan﻿. $650 Set. Nice head expression. 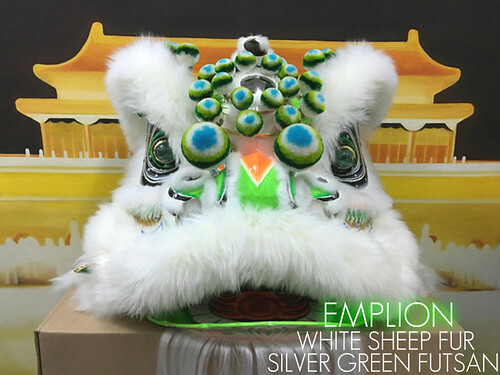 8.5 ft, 2.6 meters long sheep's fur silver and green satin body﻿, wagging pony tail, belt straps, shoulder straps and 2 lion pants. Adult Size 2, 56 inches rim. 28X28x28 inches Head. 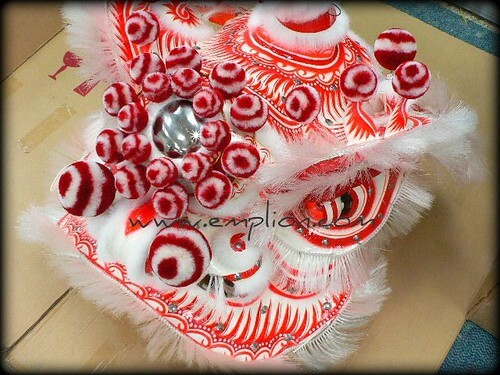 Black Fur Special Custom Red Futsan﻿. $650 Set. Nice head expression. 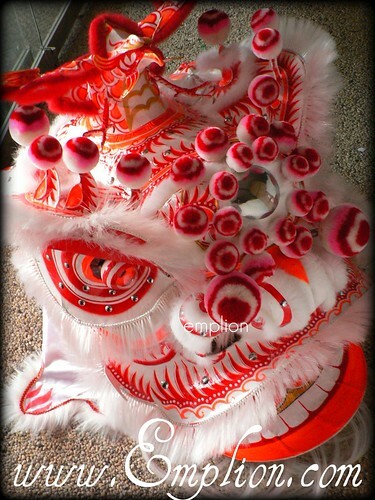 8.5 ft, 2.6 meters long sheep's fur red satin body﻿, wagging pony tail, belt straps, shoulder straps and 2 lion pants. Adult Size 2, 56 inches rim. 28X28x28 inches Head. 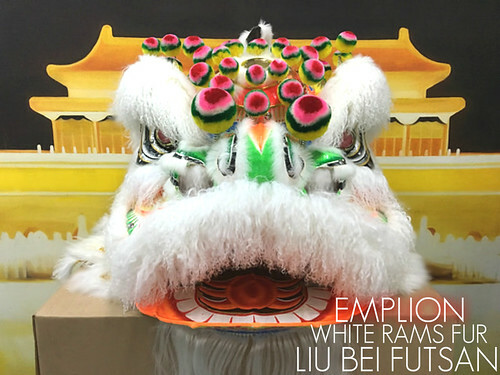 White Rams Fur Liu Bei King Lion﻿. $650. Nice head expression. 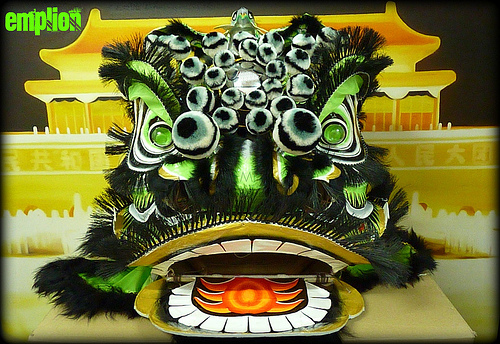 8.5 ft, 2.6 meters long sheep's fur rainbow Liu Bei body﻿, wagging pony tail, belt straps, shoulder straps and 2 lion pants. 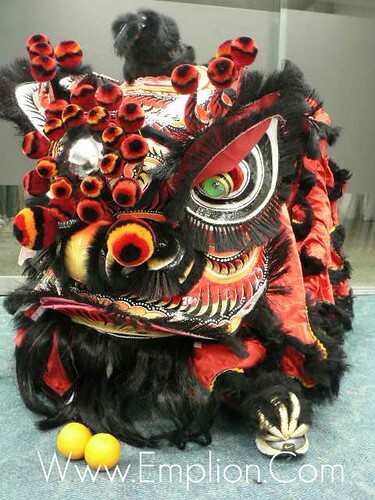 This lion requires custom order. 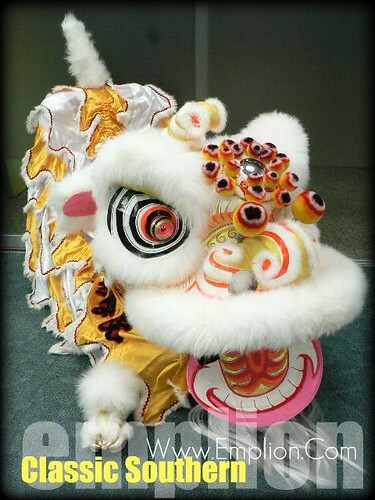 Feel free to paypal a custom deposit of $250 for this lion, balance of $300 when lion is completed. 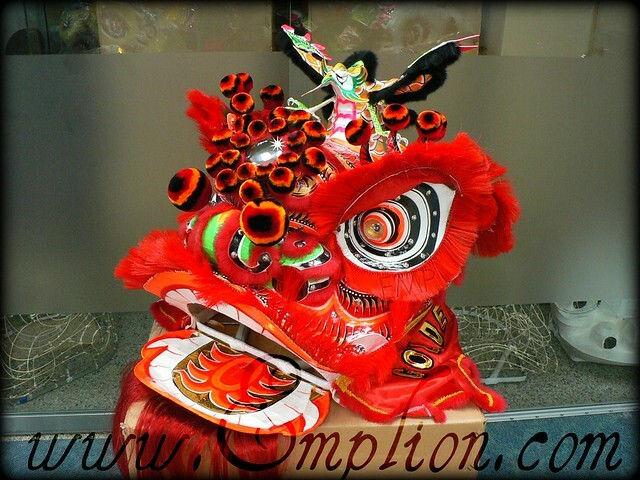 Your custom lion of $550 will be ready within 6 to 12 months time. 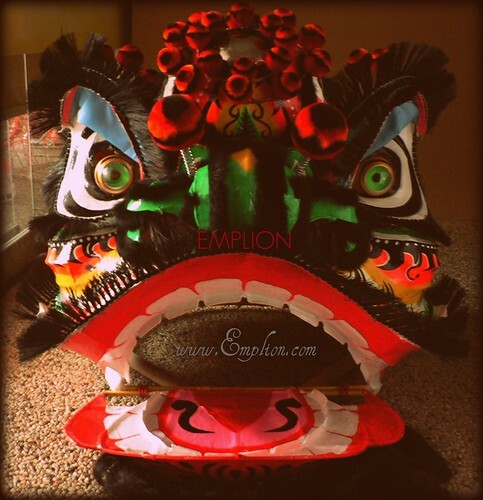 We will send you an email and deliver the lion to your home when it is ready. 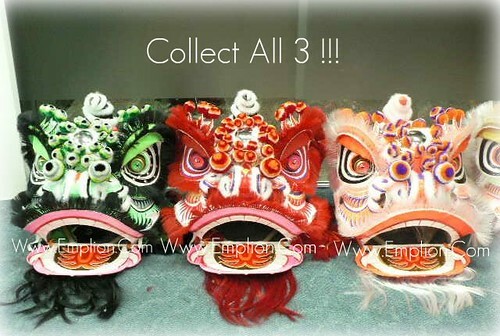 If you need the lion within 3-5 months, let us know.﻿ Priority custom service is available. 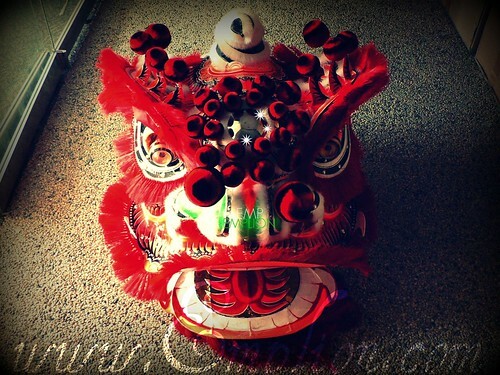 For custom lion ready within 4-6 mths add $140. If within 2-3 mths add $240 eg: $550 + $140 = $690. Adult Size 2, 56 inches rim. 28X28x28 inches Head. 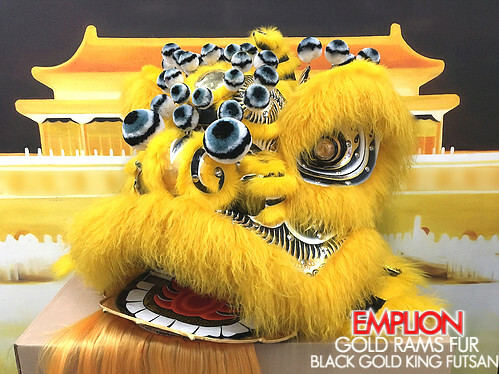 Black Bristle Fur Yellow Huang Zhong Futsan.﻿ ﻿Comes with nice head expression, 8 ft long sheep's fur yellow and black satin ﻿body, wagging pony tail, belt straps, shoulder straps and 2 lion pants. Adult Size 2, 56 inches rim. 28X28x28 inches Head. 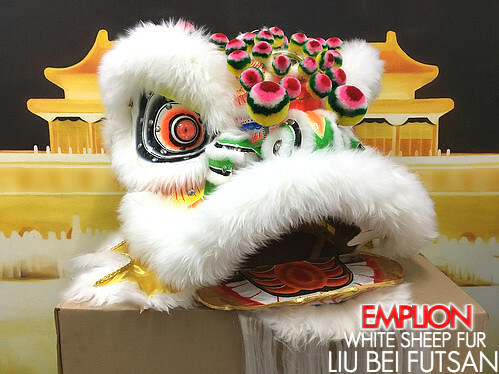 White Bristle Nylon Fur Liu Bei Lion.﻿ ﻿$650 Series. 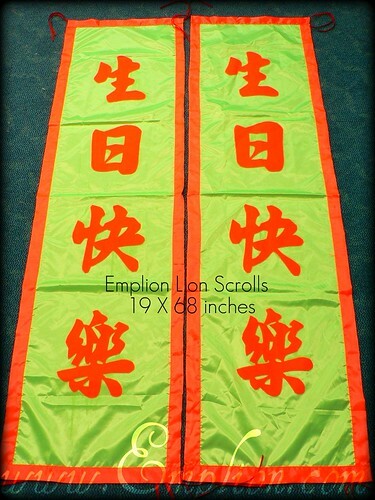 Nice head expression, 8.5 ft, 2.6 meters long sheep's fur rainbow Liu Bei style satin ﻿body, wagging pony tail, belt straps, shoulder straps and 2 lion pants. Free Shipping. 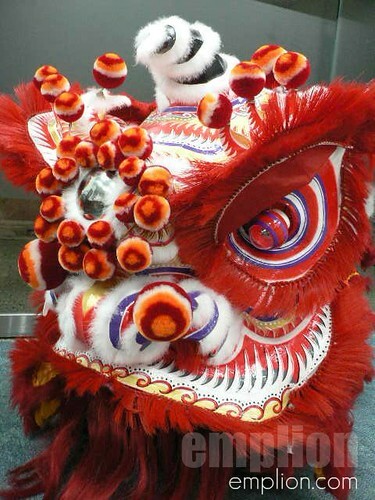 This lion requires custom order. 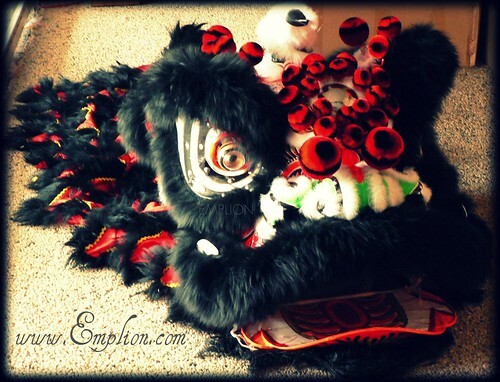 Feel free to paypal a custom deposit of $250 for this lion, balance of $400 when lion is completed. 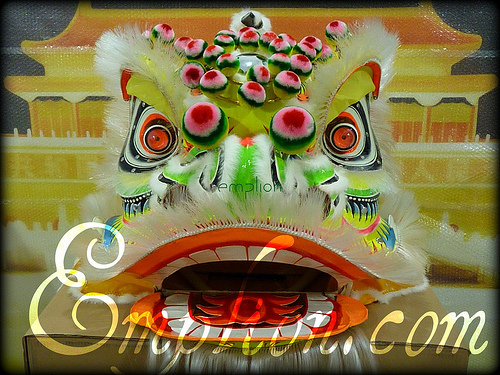 Your custom lion of $650 will be ready within 6 to 12 months time. 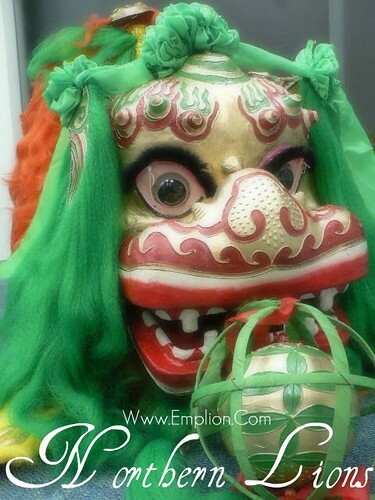 We will send you an email and deliver the lion to your home when it is ready. 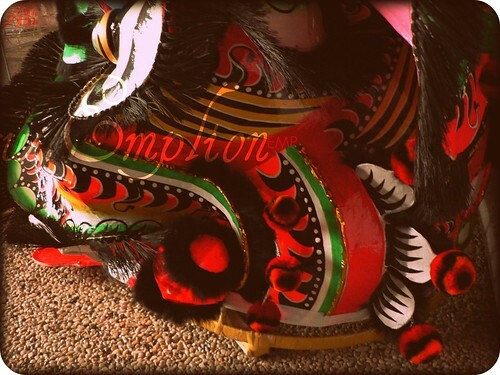 If you need the lion within 3-5 months, let us know.﻿ Priority custom service is available. 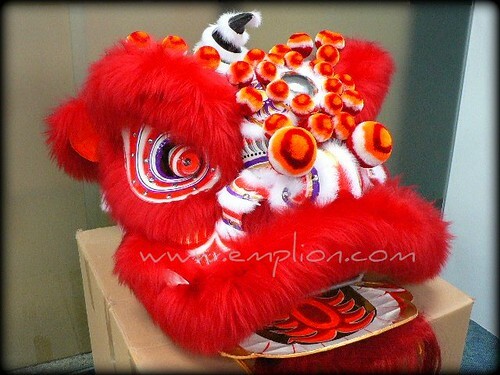 For custom lion ready within 4-6 mths add $140. If within 2-3 mths add $240 eg: $650 + $140 = $790. Adult Size 2, 56 inches rim. 28X28x28 inches Head. 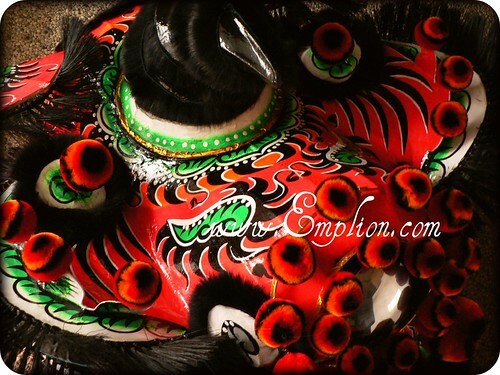 Black Bristle Fur Red Guan Yu Lion﻿﻿. $650 Series. 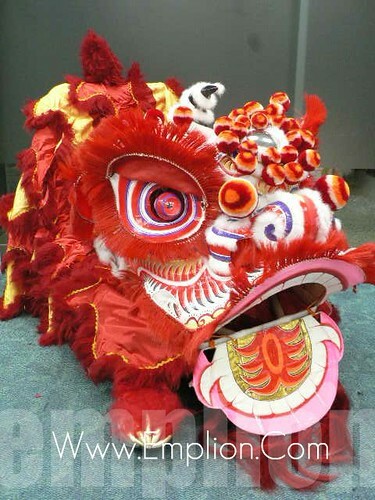 Nice head expression, 8.5 ft, 2.6 meters long sheep's fur red satin ﻿body, wagging pony tail, belt straps, shoulder straps and 2 lion pants. Adult Size 2, 56 inches rim. 28X28x28 inches Head. 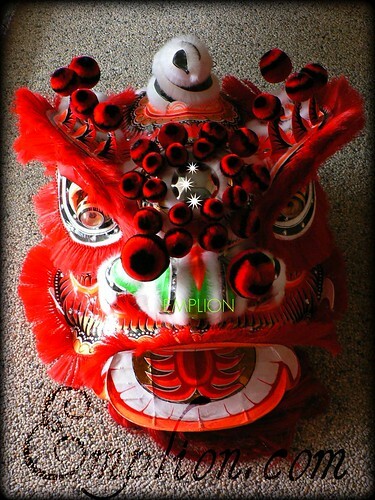 Red Bristle Fur Red Guan Yu Lion﻿﻿. $650 Series. Nice head expression. 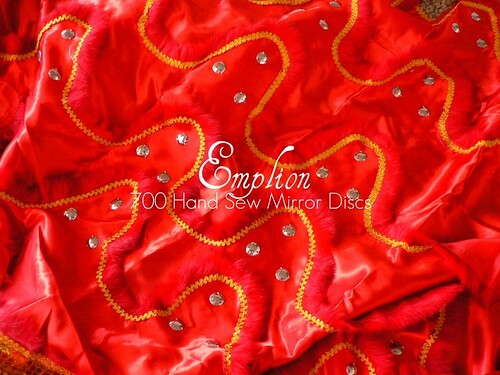 8.5 ft, 2.6 meters long sheep's fur red satin ﻿body, wagging pony tail, belt straps, shoulder straps and 2 lion pants. Adult Size 2, 56 inches rim. 28X28x28 inches Head. 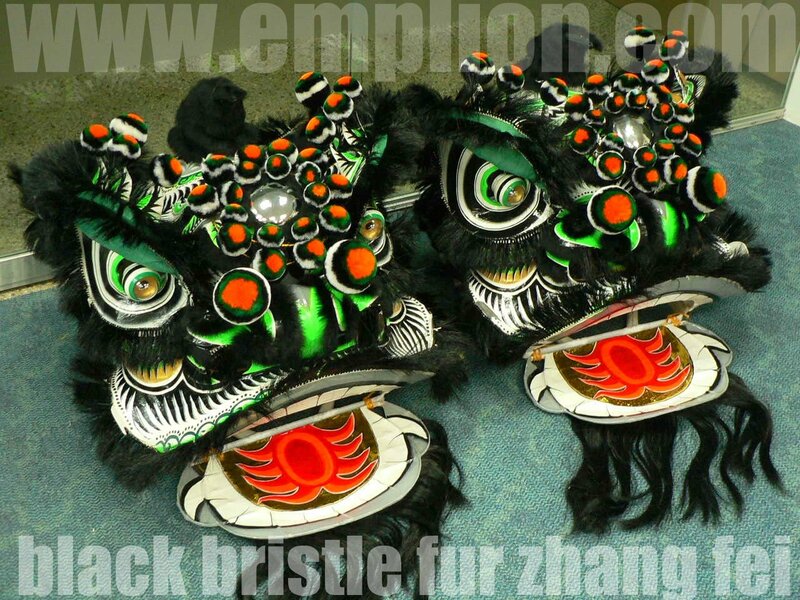 Black Bristle Fur Zhang Fei Lion ﻿$750 Series. Nice head expression. 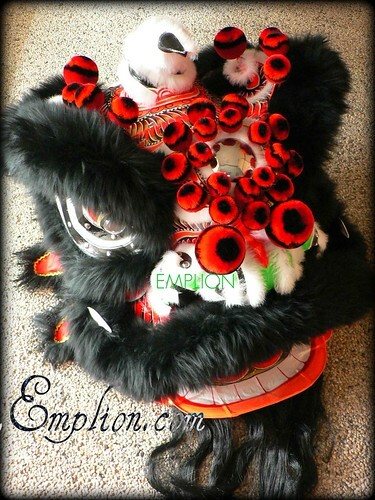 8.5 ft, 2.6 meters long sheep's fur black satin ﻿body, wagging pony tail, belt straps, shoulder straps and 2 lion pants. 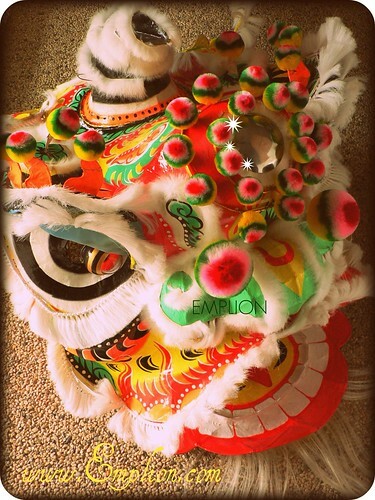 If this lion is sold. 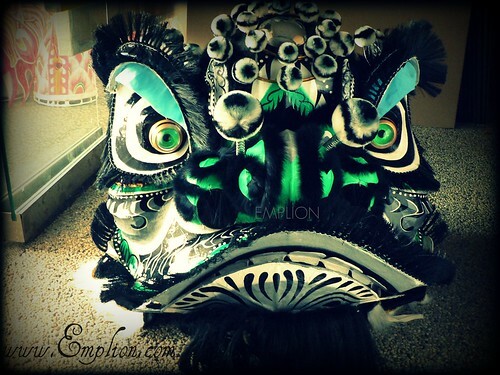 Feel free to paypal a custom deposit of $250 for this lion, balance of $400 when lion is completed. 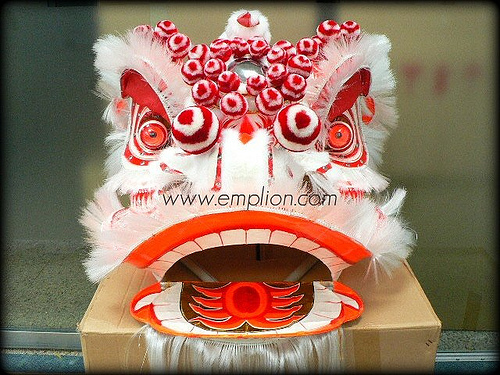 Your custom lion of $650 will be ready within 6 to 12 months time. 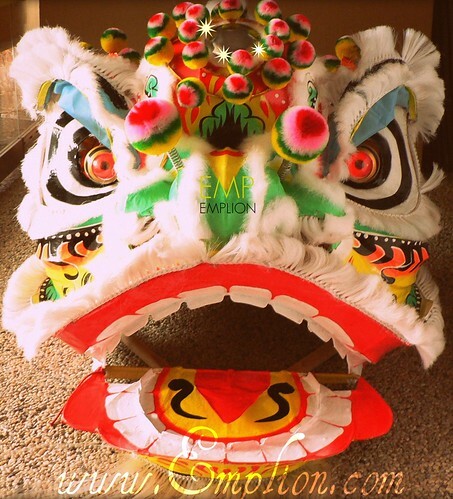 We will send you an email and deliver the lion to your home when it is ready. 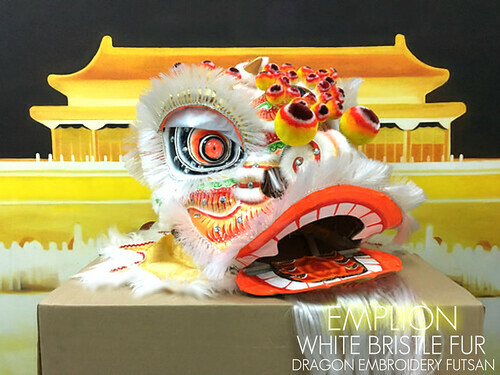 If you need the lion within 3-5 months, let us know.﻿ Priority custom service is available. 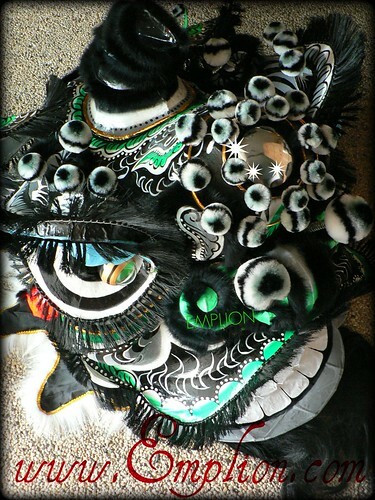 For custom Lion ready within 4-6 mths add $140. If within 2-3 mths add $240 eg: $650 + $140 = $790. Adult Size 2, 56 inches rim. 28X28x28 inches Head. 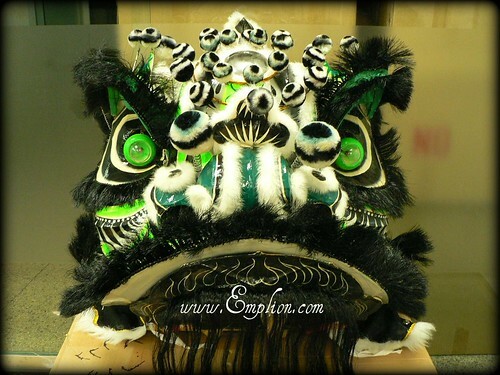 Black Bristle Fur Zhao Zhi Long Lion﻿﻿﻿. $650 Series. 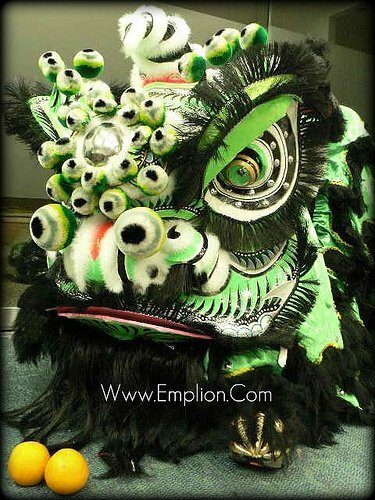 Nice head expression, 8.5 ft, 2.6 meters long sheep's fur green satin ﻿body, wagging pony tail, belt straps, shoulder straps and 2 lion pants. Adult Size 2, 56 inches rim. 28X28x28 inches Head. 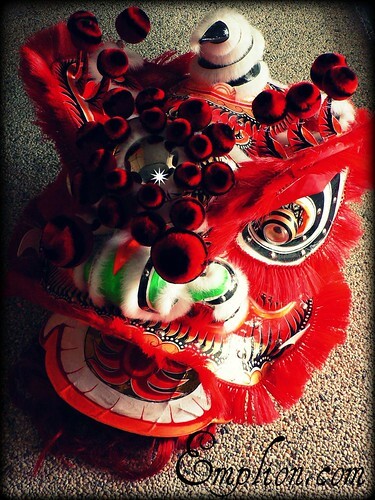 Red Bristle Fur Red Gold Lion﻿﻿﻿. $650 Series. 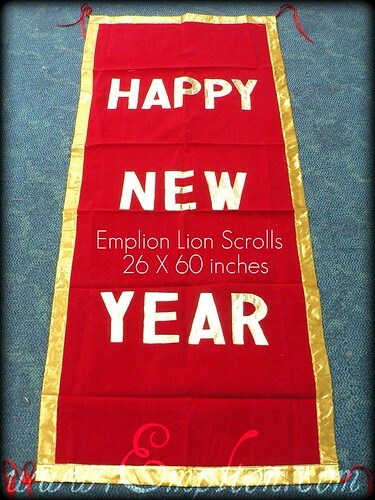 Nice head expression, 8.5 ft, 2.6 meters long sheep's fur red and gold satin ﻿body, wagging pony tail, belt straps, shoulder straps and 2 lion pants. Adult Size 2, 56 inches rim. 28X28x28 inches Head. 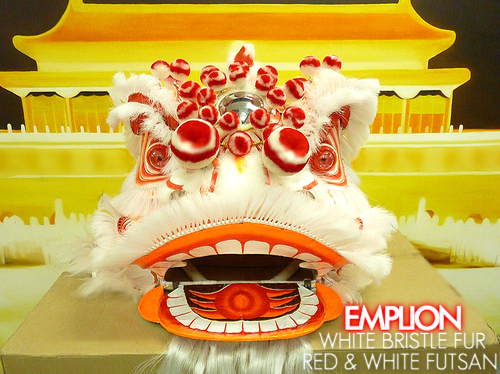 White Bristle Fur Red White Lion﻿. $650 Series. 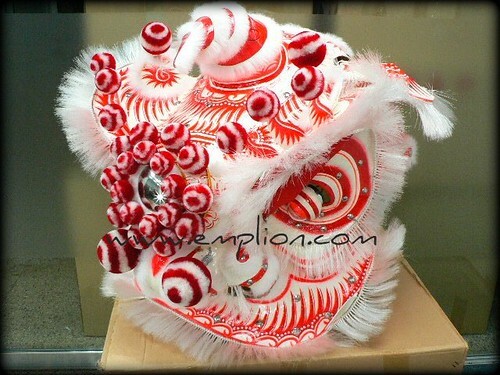 Nice head expression, 8.5 ft, 2.6 meters long sheep's fur silkscreen red tiger stripes body﻿, wagging pony tail, belt straps, shoulder straps and 2 lion pants. Free Shipping. Baby Size 4, 48 inches rim. 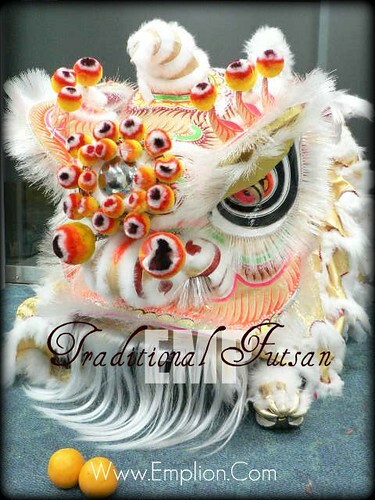 White Bristle Fur Red White Futsan with silkscreen red tiger stripes on white ﻿satin body, wagging pony tail, belt clips, shoulder straps and 2 lion pants. Free Shipping. Adult Size 2, 56 inches rim. 28X28x28 inches Head. 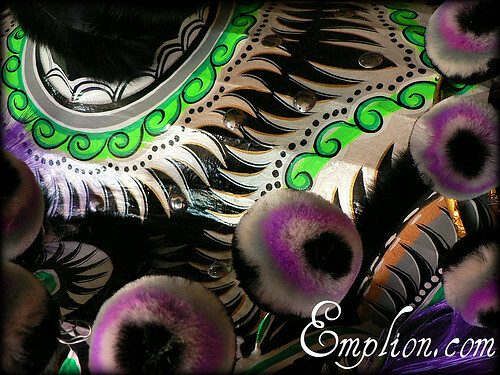 Purple Bristle Fur Black Purple Lion﻿. $650 Series. 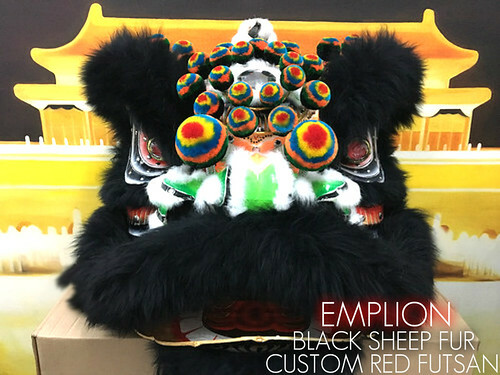 Nice head expression, 8.5 ft, 2.6 meters long sheep's fur black satin body﻿, wagging pony tail, belt straps, shoulder straps and 2 lion pants. $10 each. 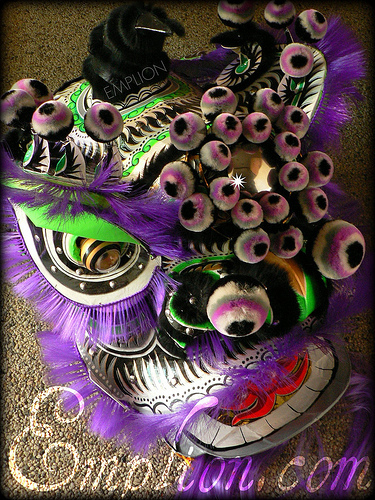 Add Purple Fur Lion Claws. Adult Size 2, 56 inches rim. 28X28x28 inches Head. 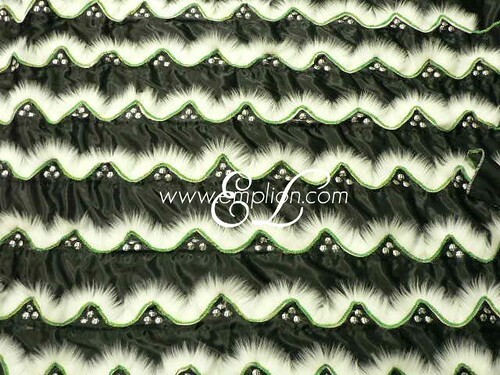 Purple Bristle Fur Black with Green Accent Lion﻿. $650 Series. 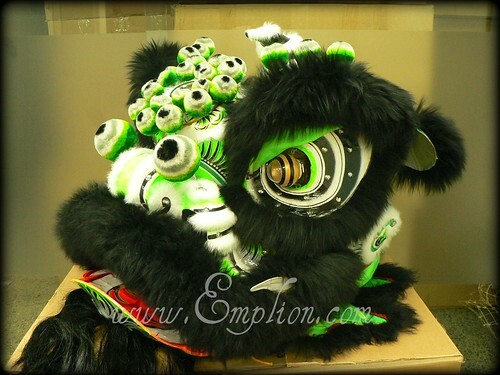 Nice head expression, 8.5 ft, 2.6 meters long sheep's fur black satin body﻿, wagging pony tail, belt straps, shoulder straps and 2 lion pants. Free Shipping. Adult Size 2, 56 inches rim. 28X28x28 inches Head. 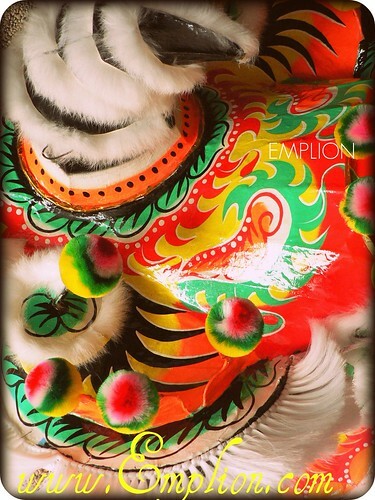 White Bristle Fur Purple Orange﻿ Lion﻿. $650 Series. Nice head expression. 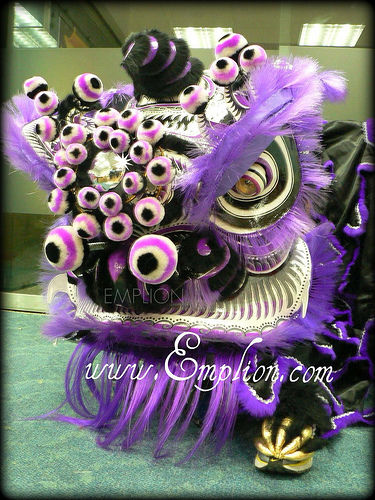 8.5 ft, 2.6 meters long sheep's fur purple and orange satin body﻿, wagging pony tail, belt straps, shoulder straps and 2 lion pants. Free Shipping. Adult Size 2, 56 inches rim. Blue Bristle Unique Rare Blue Futsan. 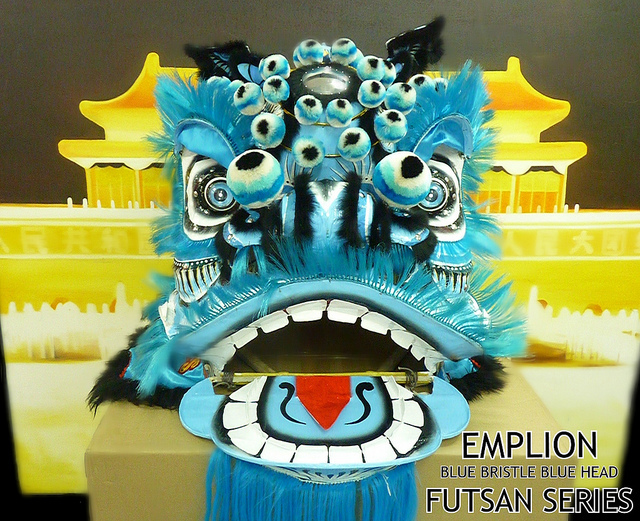 8ft Blue satin body, wagging pony tail, belt straps, shoulder straps and 2 lion pants. High Quality Series. Free Shipping. Door to door delivery. 2-12 Days Arrival. ﻿Grade 1 Quality. Adult Size 2, 56 inches rim. 28X28x28 inches Head. 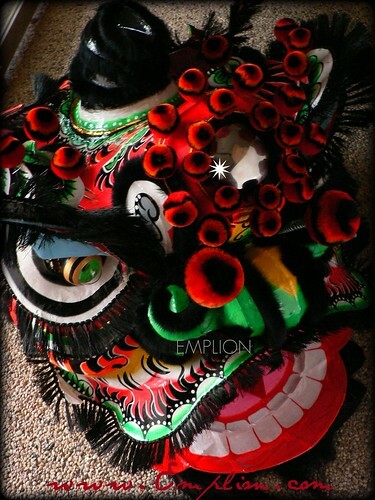 Black Bristle Nylon Fur Soaring Eagle Horn Zhang Fei Lion ﻿$750 Series. Nice head expression. 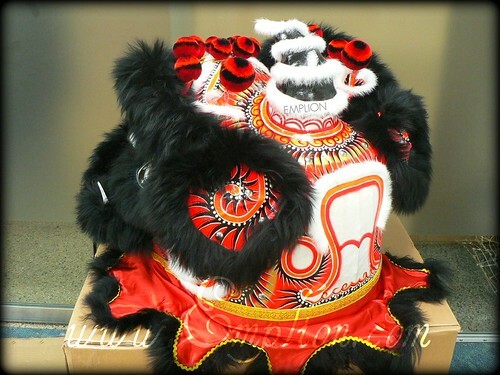 8.5 ft, 2.6 meters long sheep's fur black satin ﻿body, wagging pony tail, belt straps, shoulder straps and 2 lion pants. Adult Size 2, 56 inches rim. 28X28x28 inches Head. 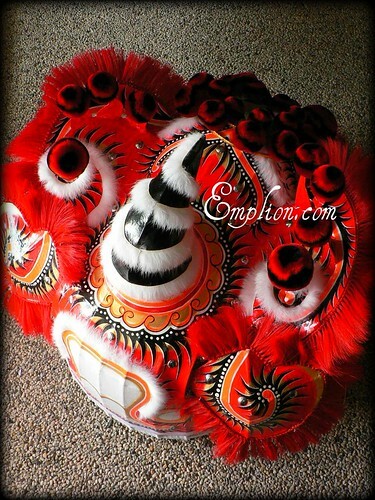 Red Bristle Nylon Fur Soaring Eagle Horn Guan Yu Lion ﻿$750 Series. Nice head expression. 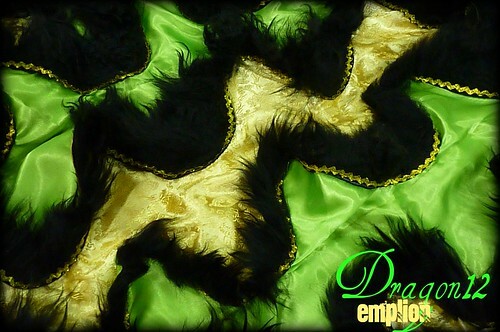 8.5 ft, 2.6 meters long sheep's fur green satin ﻿and gold dragon embroidery body, wagging pony tail, belt straps, shoulder straps and 2 lion pants. Adult Size 2, 56 inches rim. 28X28x28 inches Head. 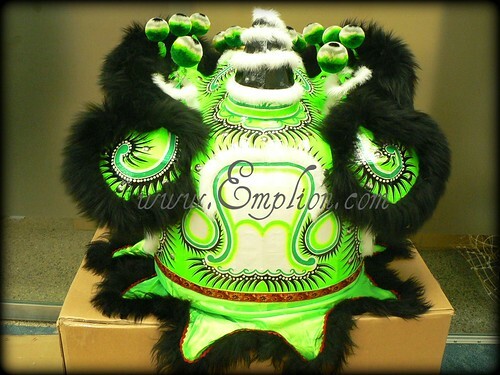 Black Bristle Nylon Fur Soaring Eagle Horn Zhao Zi Long Lion ﻿$750 Series. Nice head expression. 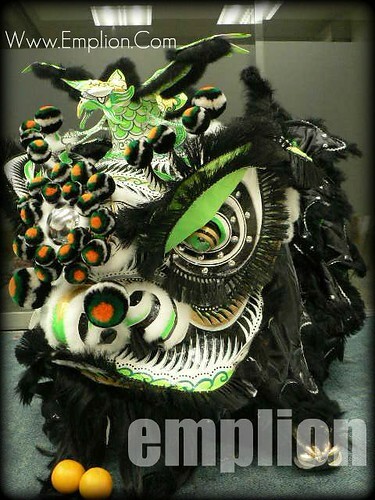 8.5 ft, 2.6 meters long sheep's fur green satin ﻿and gold dragon embroidery body, wagging pony tail, belt straps, shoulder straps and 2 lion pants. Adult Size 2, 56 inches rim. 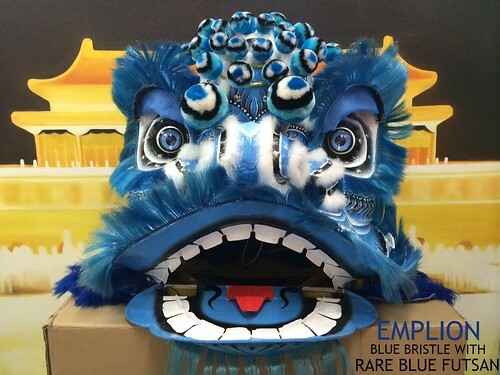 Blue Bristle Nylon Fur Soaring Eagle Horn Blue Lion ﻿$750 Series. Nice head expression. 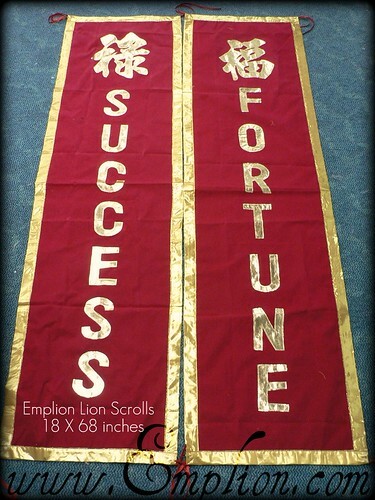 8.5 ft, 2.6 meters long sheep fur blue satin body, wagging pony tail, belt straps, shoulder straps and 2 lion pants. Adult Size 2, 56 inches rim. 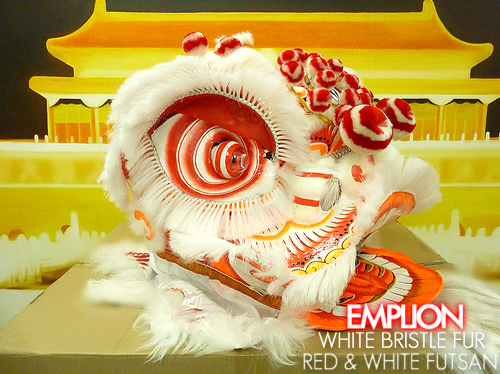 White Bristle Nylon Fur Soaring Eagle Horn Red White Lion ﻿$750 Series. Nice head expression. 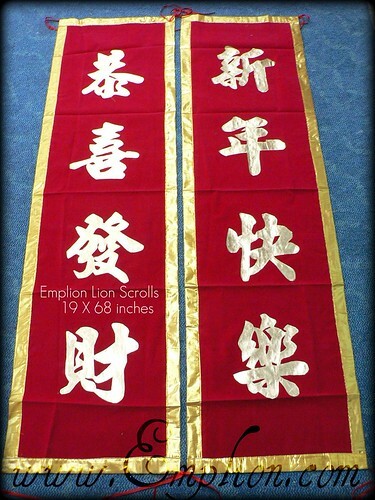 8.5 ft, 2.6 meters long sheep fur silkscreen red tiger stripes body, wagging pony tail, belt straps, shoulder straps and 2 lion pants. Adult Size 2, 56 inches rim. 28X28x28 inches Head. 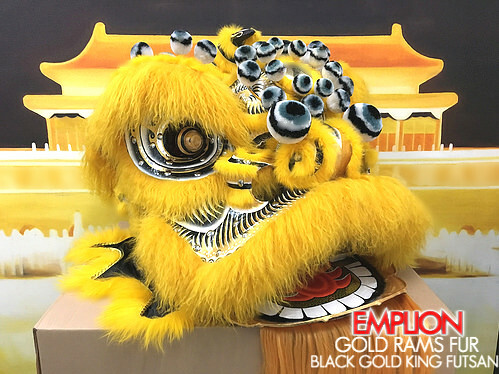 Emplion Red Rams Fur Black Gold King Lion﻿﻿. $650 Series. Nice head expression. 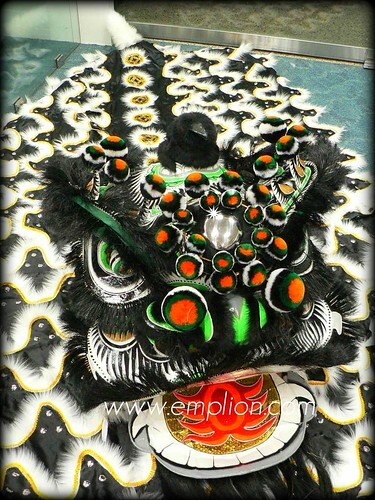 8.5 ft, 2.6 meters long sheep fur black gold satin body﻿, wagging pony tail, belt straps, shoulder straps and 2 lion pants. Free Shipping. Adult Size 2, 56 inches rim. 28X28x28 inches Head. 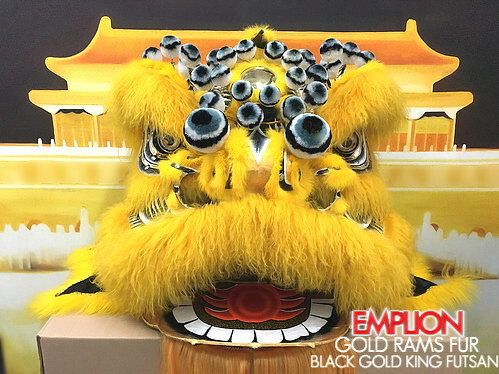 Emplion Gold Rams Fur Black Gold King Lion. $650 Series. Nice head expression. 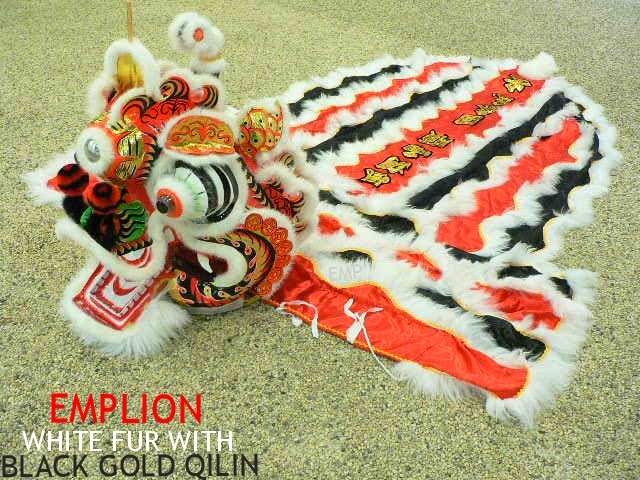 8.5 ft, 2.6 meters long sheep fur black and gold satin body﻿, wagging pony tail, belt straps, shoulder straps and 2 lion pants. Free Shipping. Adult Size 2, 56 inches rim. 28X28x28 inches Head. 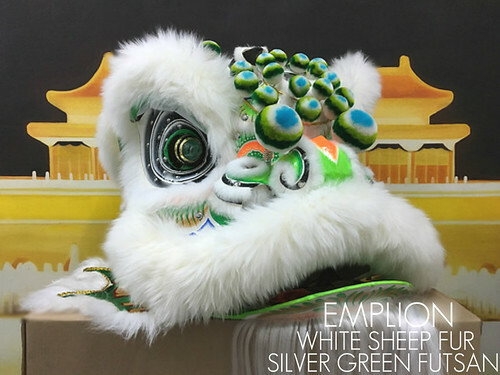 Emplion Gold Rams Fur White Gold King Lion. $650 Series. Nice head expression. 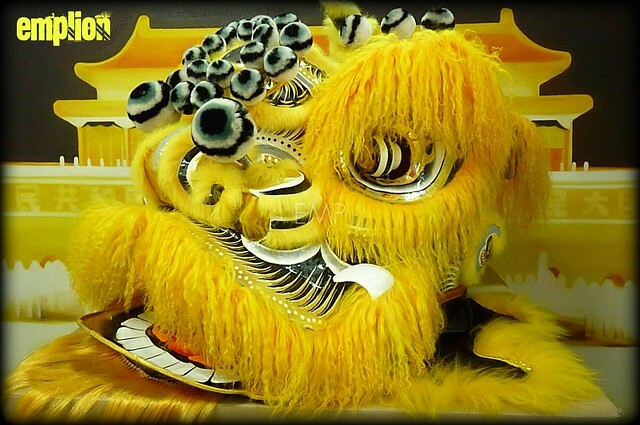 8.5 ft, 2.6 meters long sheep fur silkscreen gold tiger stripes white satin body﻿, wagging pony tail, belt straps, shoulder straps and 2 lion pants. Adult Size 2, 56 inches rim. 28X28x28 inches Head. 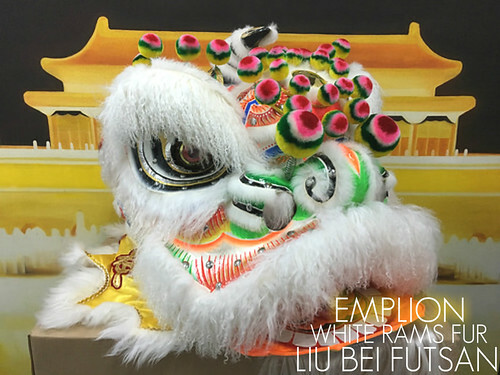 White Sheep Fur Liu Bei Lion﻿. $650 Series. Nice head expression. 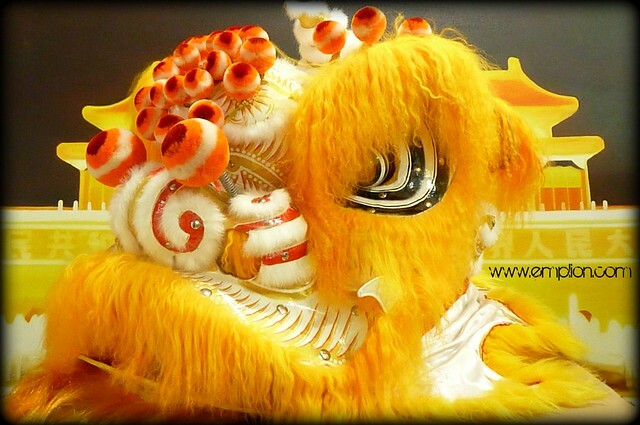 8.5 ft, 2.6 meters long sheep's fur rainbow Liu Bei body﻿, wagging pony tail, belt straps, shoulder straps and 2 lion pants. Adult Size 2, 56 inches rim. 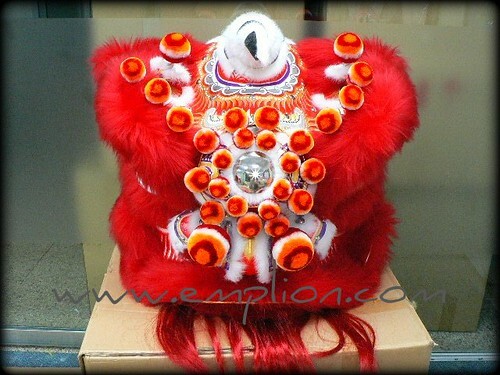 Black Sheep Fur Red Guan Yu Lion﻿. $650 Series. Nice head expression. 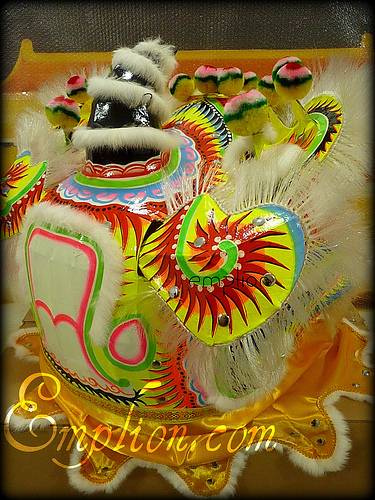 8.5 ft, 2.6 meters long sheep's fur rainbow Liu Bei body﻿, wagging pony tail, belt straps, shoulder straps and 2 lion pants. Free Shipping. Adult Size 2, 56 inches rim. 28X28x28 inches Head. 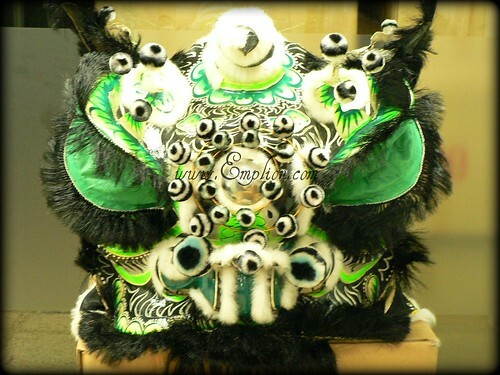 Black Sheep Fur Zhao Zi Long Lion﻿. $650 Series. Nice head expression. 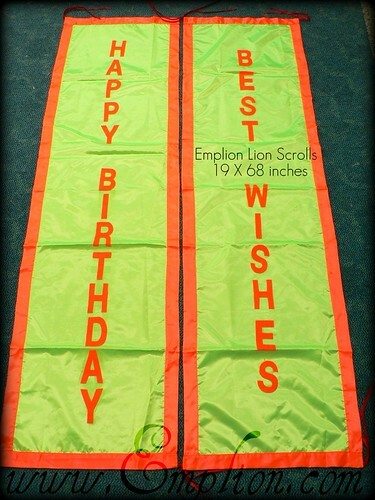 8.5 ft, 2.6 meters long sheep's fur green satin body﻿, wagging pony tail, belt straps, shoulder straps and 2 lion pants. Adult Size 2, 56 inches rim. 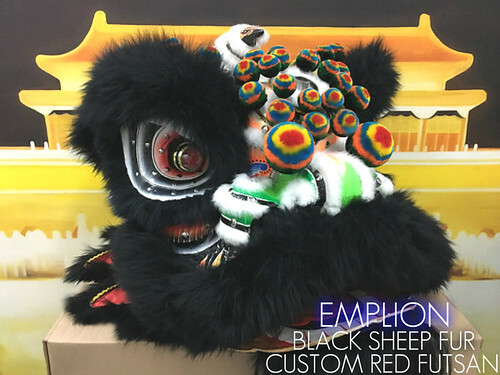 Black Sheep Fur Zhao Zi Long Rainbow Accent Lion﻿. $650 Series. Nice head expression. 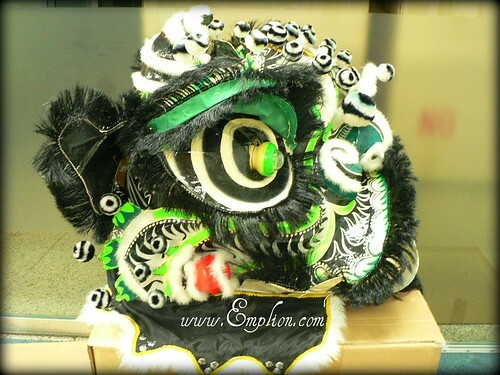 8.5 ft, 2.6 meters long sheep's fur green satin body﻿, wagging pony tail, belt straps, shoulder straps and 2 lion pants. Adult Size 2, 56 inches rim. 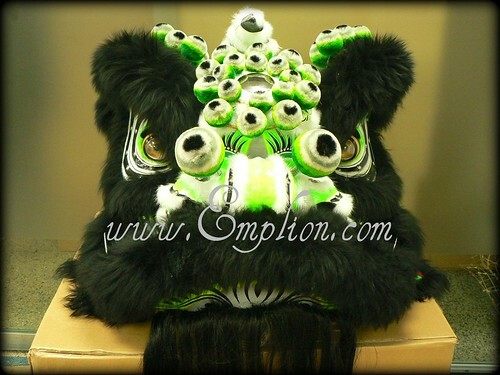 Green Sheep Fur Special Custom Color Lion﻿. $650 Series. Nice head expression. 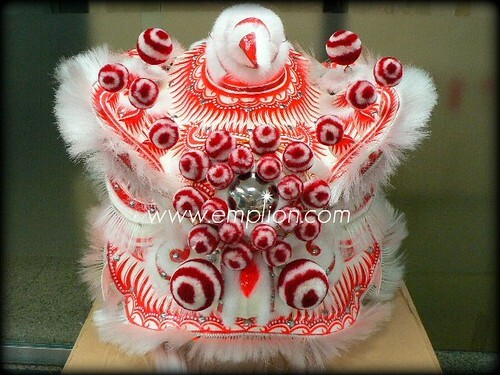 8.5 ft, 2.6 meters long sheep's fur white satin body﻿, wagging pony tail, belt straps, shoulder straps and 2 lion pants. $10 each. 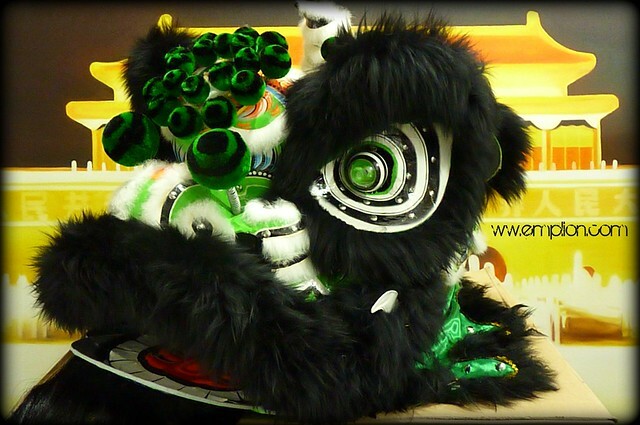 Add Green Fur Lion Claws. Adult Size 2, 56 inches rim. 28X28x28 inches Head. 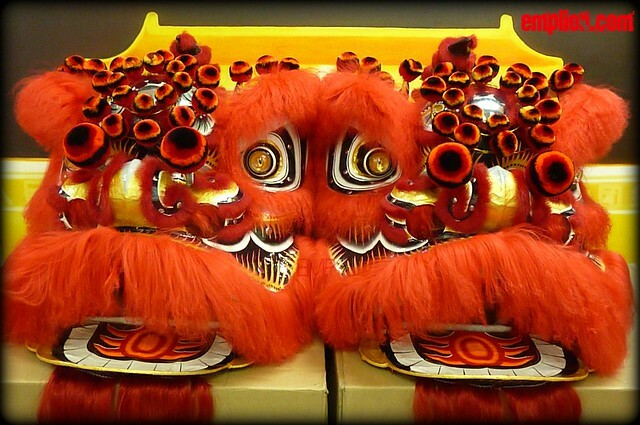 Red Sheep Fur Red Gold Lion﻿. $650 Series. Nice head expression. 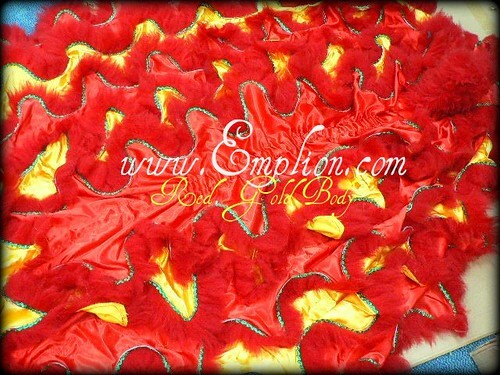 8.5 ft, 2.6 meters long sheep's fur red and gold satin body﻿, wagging pony tail, belt straps, shoulder straps and 2 lion pants. Adult Size 2, 56 inches rim. 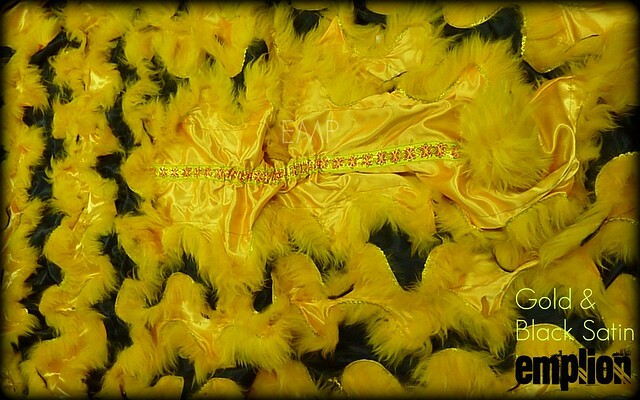 White Sheep Fur Yellow Huang Zhong Classic Style Hoksan﻿﻿. $650 Series. Nice head expression. 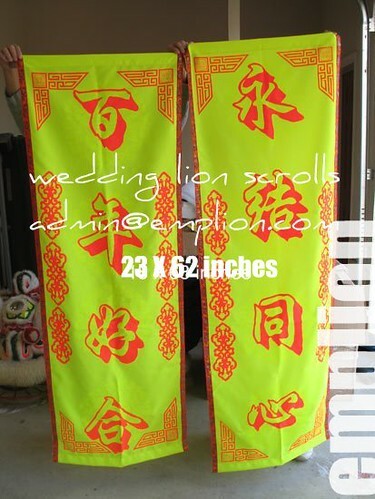 7 ft, 2.1 meters long sheep's fur silkscreen black tiger stripes with yellow satin body﻿, wagging pony tail, belt straps, shoulder straps and 2 lion pants. Adult Size 2, 56 inches rim. White Sheep Fur White Gold Classic Style Hoksan﻿﻿. $650 Series. Nice head expression. 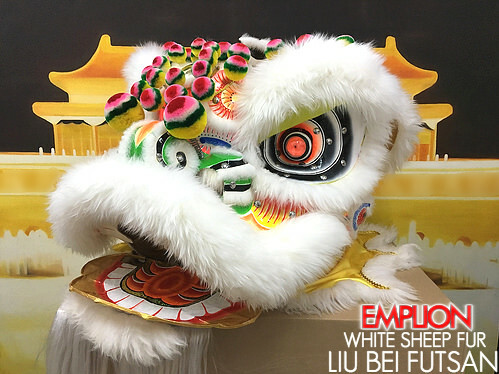 7 ft, 2.1 meters long sheep's fur white and gold satin body﻿, wagging pony tail, belt straps, shoulder straps and 2 lion pants. 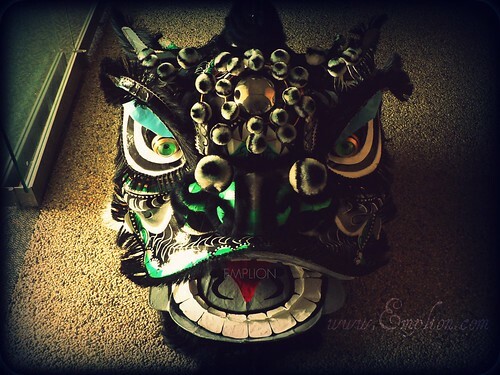 Custom QiLin. 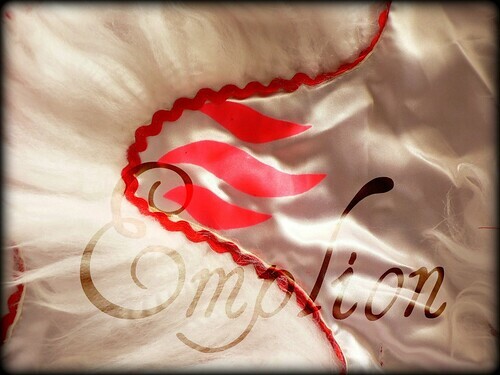 All colors are available for custom. 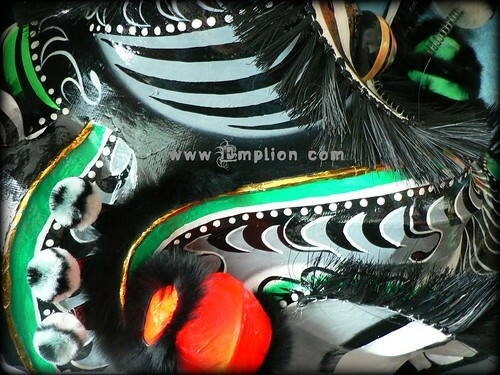 Black, Red, Yellow, Green, Gold. Adult Size 2, 56 inches rim. 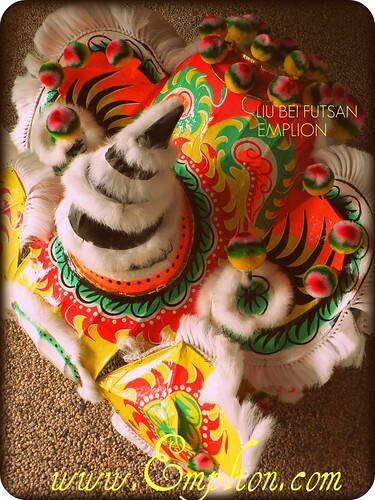 White Fur Black Gold QiLin﻿﻿﻿. $650 Series. Nice head expression. 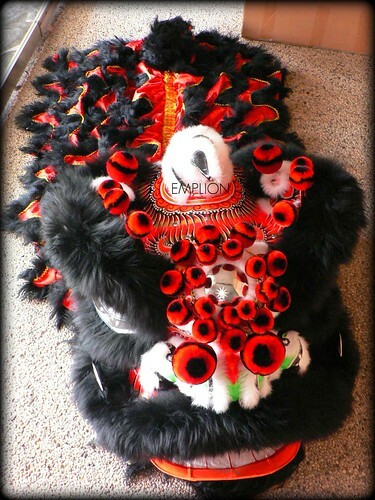 8.8 ft, 2.8 meters long sheep's fur red and black satin body﻿, wagging pony tail, belt straps, shoulder straps and 2 lion pants. Free Shipping. Adult Size 2, 56 inches rim. 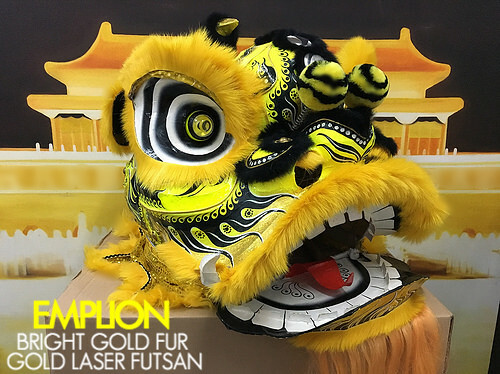 Bright Gold Wolf Fur Gold Laser 3 Mirrors Futsan with Gold Sequin Body. 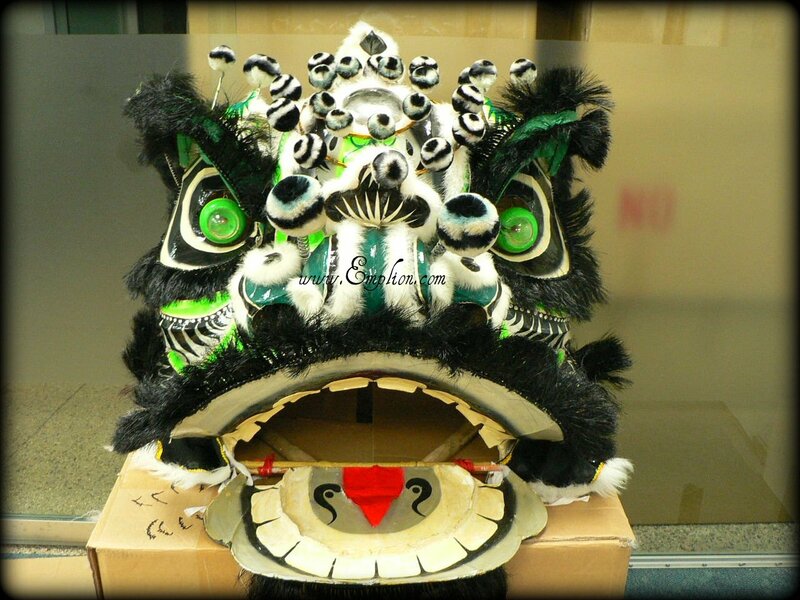 Comes with nice lion head expression, 7 ft, 2.15 meters body, wagging pony tail, belt straps, shoulder straps and 2 lion pants. Free Shipping. While stock last! 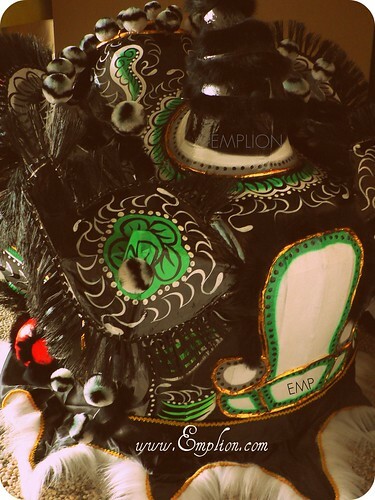 If this lion is sold. 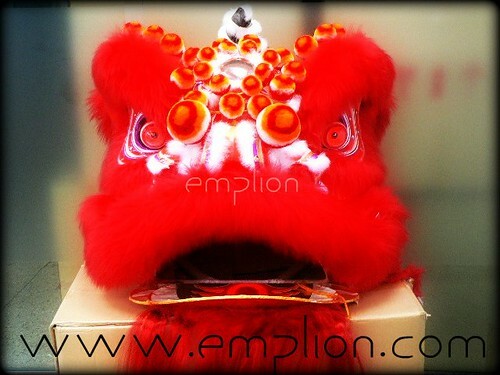 Feel free to paypal Emplion a custom deposit of $250 for this lion, balance of $500 when lion is completed. 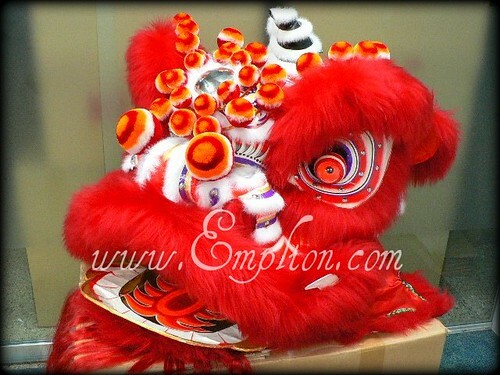 Your custom lion of $750 will be ready within 6 to 12 months time. 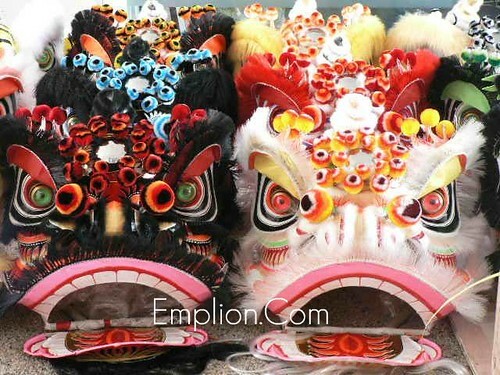 We will send you an email and deliver the lion to your home when it is ready. 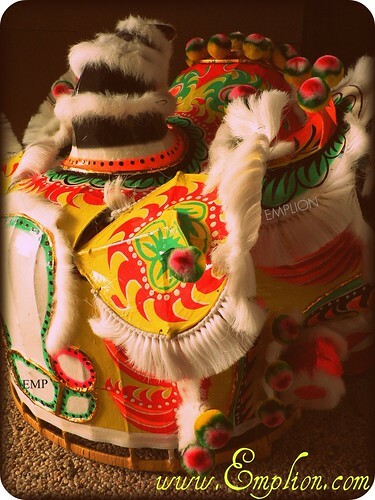 ﻿ If you need the lion within 3-5 months, let us know.﻿ Priority custom lion service is available. 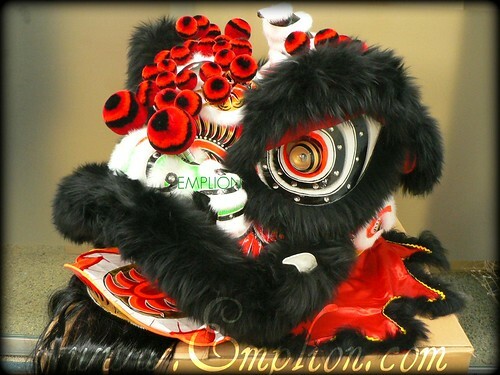 For custom Lion ready within 4-6 mths add $140. If within 2-3 mths add $240 eg: $750 + $140 = $890. 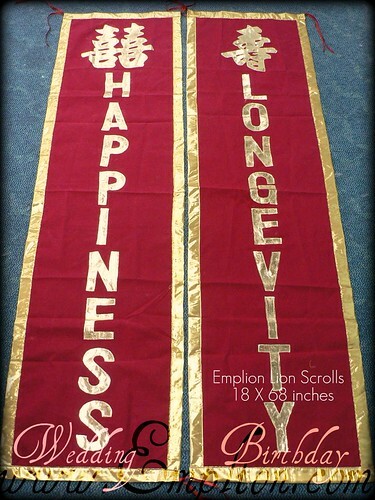 Adult Size 2, 56 inches rim. 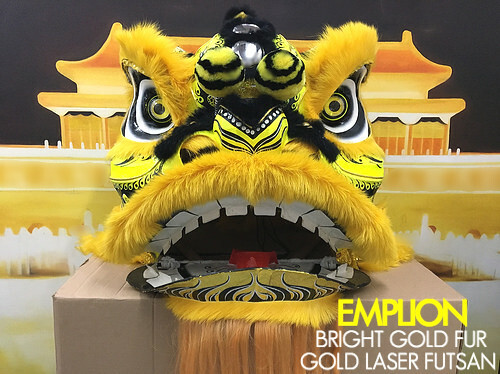 Bright Gold Wolf Fur Gold Laser 3 Mirrors﻿ Futsan with Gold Sequin Body. 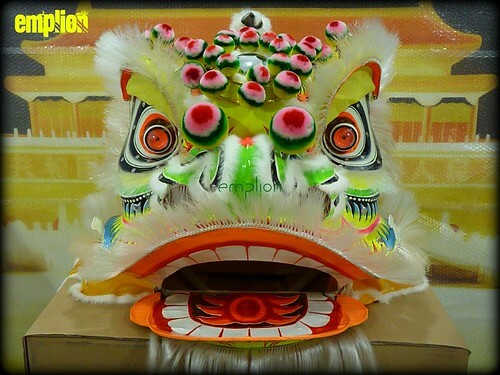 Comes with nice lion head expression, 7 ft, 2.15 meters body, wagging pony tail, belt straps, shoulder straps and 2 lion pants. Free Shipping. While stock last!